If you’ve ever been to the States, or even read a US-based beauty blog, you’ll more than likely be aware of the beauty behemoth that is Sephora (actually a French company, but most successful in America). Selling absolutely everything your makeup, skincare, nailwear and perfume wardrobes could ever need, we’ve been very jealous of the beauty superstore ever since it went out of business in the UK a few years back. This may or may not be a brand-new thing (we’ve only just become aware of it, otherwise we wouldn’t have been able to pay our rent last month!) but we’re pretty happy either way. Bear in mind that there are a few restrictions on Sephora UK shipping: you can’t ship things that could be hazardous, like nail varnish remover or pressurised sprays, to the UK. Some folks have told us they’ve had problems with things packaged in glass (nail polish, perfume…) and even moisturiser (for no apparent reason), but the majority of products should still be available, especially in the makeup section. That means you can buy brands not available over here, like Make Up For Ever, and products that aren’t out yet in the UK. And it’s all at beautifully cheap US prices, with shipping only costing about the same as next-day in the UK as long as you spend over £75. Under that threshold, you pay the actual cost of shipping, which will likely be higher. 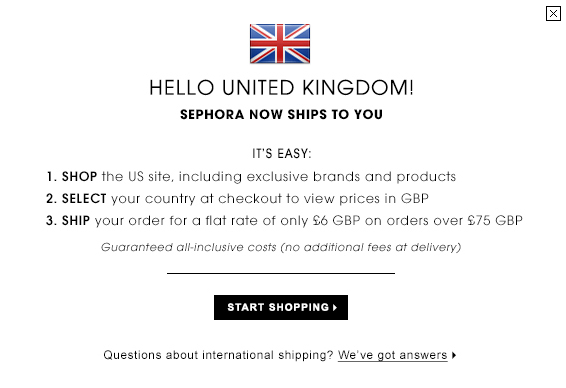 Sephora promises “no additional fees at delivery”, but it’s not currently clear whether that means there’ll be no import tax, which sometimes gets whacked on when you buy things from out of the country. Presumably not, though, which would be a relief. *This may or may not have happened to me. JIVR Bike hits Kickstarter: Will e-bikes signal the end of the commute?